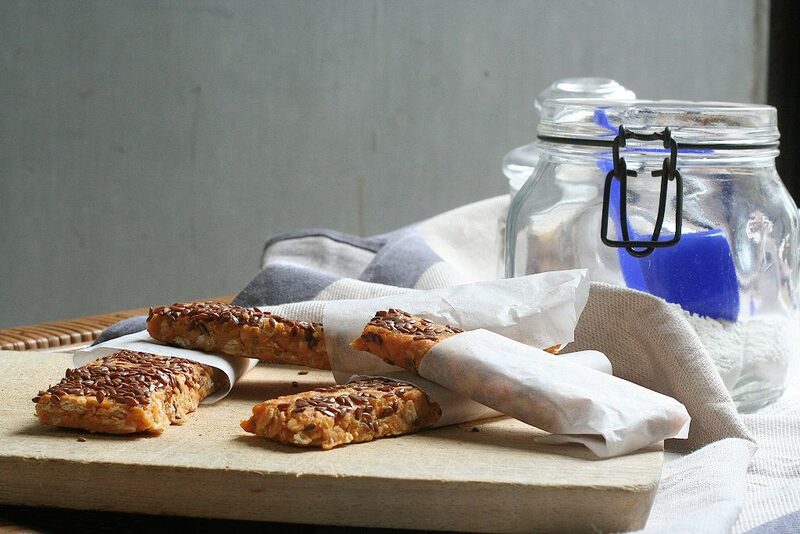 These sweet potato and peanut butter protein bars are great for an energy boost. They are easy to make and satisfy those sweet cravings. It could be a dessert made with sweet potato because the sweet potatoes are naturally soooo sweet. I love all kinds of energy bars, I carry them everywhere and I often use them before and after training, depending on when meals are. I never train on an empty stomach. I tried the famous early morning fasted cardio, I almost passed out … no thanks, I’m out… it is important to train respecting your body and its requirements … that’s what matters to me. I compare my body to a car, it always needs fuel to run … in my case to train. So why I should weaken it? Honestly, I don’t get it … yes ok, that fat burning blah blah … I eat. Actually, I was a bit tired of all the usual commercial bars, pretty easy to carry about, but the homemade ones have an essential added value. If I can do it on my own … I’m doing it. So, from a leftover sweet potato sitting all alone in the fridge, I pulled out these moist, soft and gooey bars. I make them the night before and bring them with me as a post.workout snack. Most importantly, they are packed full of nutrients and very satisfying. If they are homemade energy bars…well, it’s even better. I don’t use these bars as pre-workout, because I prefer to stay on protein and carbohydrates sources. 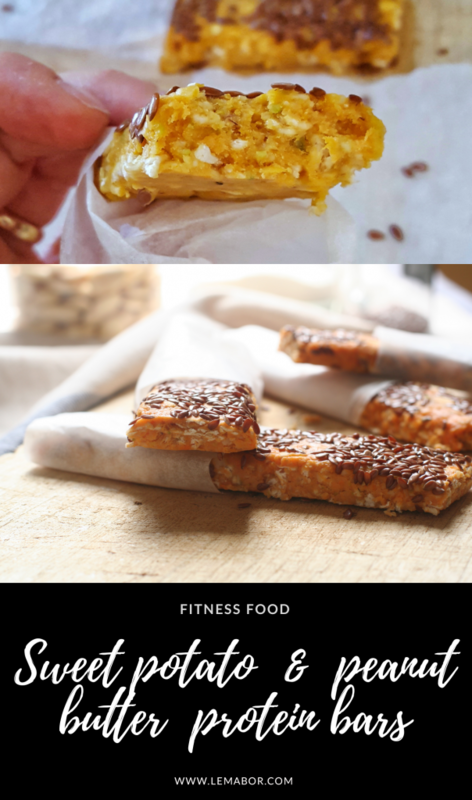 Usually, I add fat in my main meals or even in post-workout snacks when the next meal is far away, otherwise I go straight to the meal skipping the post wo snack. Adding fat in pre-workout snacks gets me overloaded and bloated, I don’t metabolize them well and risk compromising the workout. Product availability: is pretty good. The sweet potatoes are now easily found at the supermarket, they used to be impossible to find if not at a few fashion shops, obviously high priced. The traditional potato is fine as well, I’m not a huge fan of the sweet one, I do not consider it as a superfood … I hate that word … there isn’t a big difference between them and in some values ​​the white potato is a winner (i.e. minerals). If you want to see a good infographic about this topic, you can find it here. To make these 6 bars I spent a total of € 2.60, just over € 0.40 a bar, so given the average price of a bar let’s say the ratio is 1: 6 … it’s not too bad. Prepare time: 20 minutes more rest time in the refrigerator for a couple of hours. 1. Boil the sweet potato and when cooked mash it with a potato masher. 2. Put pistachios, almonds, protein powder in the mixer and lightly blend, it should not become a flour. 3. Add the peanut butter and coconut oil to the potato mash, mix well and allow to cool. 4. Add the oats to the potato mixture along with pistachios, almonds and protein powder and mix uniformly into a ball. 5. Place on baking paper and flatten it, forming a square about 1cm high, sprinkle with the linseed and then cut into bars, it should make 6. 6. Wrap in baking paper and put in the refrigerator until they are well hardened. Moist and gooey delicious energy bars. Boil the sweet potato and when cooked mash it with a potato masher. Put pistachios, almonds, protein powder in the mixer and lightly blend, it should not become a flour. Add the peanut butter and coconut oil to the potato mash, mix well and allow to cool. 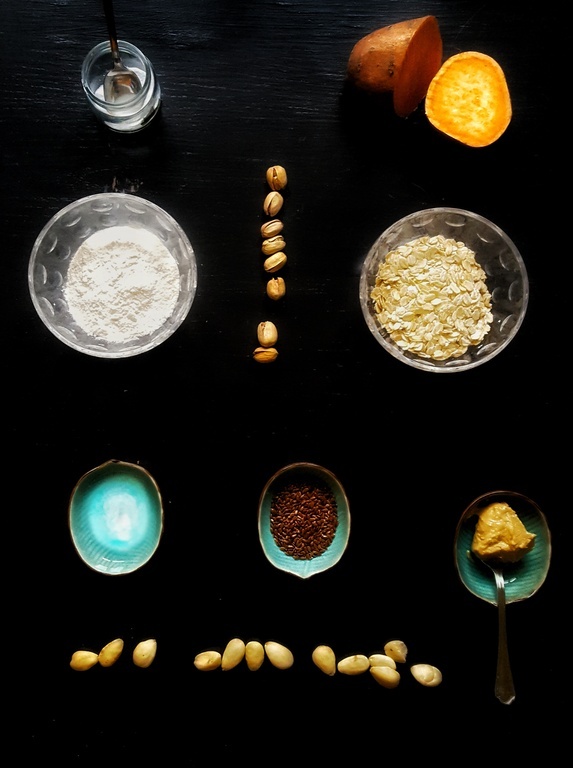 Add the oats to the potato mixture along with pistachios, almonds and protein powder and mix uniformly into a ball. Place on baking paper and flatten it, forming a square about 1cm high, sprinkle with the linseed and then cut into bars, it should make 6. Wrap in baking paper and put in the refrigerator until they are well hardened.